“To be a good Spaniard, it is your first duty. But do not forget that you are French by birth,” said the Sun King, Luis XIV of France, when saying goodbye to his grandson, the Duke of Anjou, when he went to Spain to occupy the throne as Felipe V. These same words echo through the walls of the marvelous Jardines del Palacio Real of La Granja that, despite its many Hispanic characteristics, throbs with a French heart, embedded by the nostalgia of the lavish court where the monarch spent the first 17 years of his life. The king discovered this untouched gem (measuring about 1,200 m) in 1718 on a hunt, and he fell in love with it for its endless forests of pine and its crystalline water springs. It was a perfect refuge from the arid Castillian plateau, that was so alien to the young sovereign, created by the sweet greenery and humid landscapes of his native land. At that moment, there was already a park for the monks of Jerónimo and a medieval hermitage dedicated to San Ildefonso. The monarch, who began to suffer from severe depression and other psychological problems, was contemplating renouncing his claim to the throne in spite of his youth and looking for a place to retire. At last, he began construction of the palace and the gardens of La Granja de San Ildefonso in 1720. Three years later, the private apartments of the king were finished, and in January of 1724, he abdicated to his son Luis I. However, his retirement did not last. Six months later, his first born and successor died, so Felipe V had to again assume the throne in 1746. This change in plan also affected the farm that was supposed to be a place of retirement. It ended up being the palace of a reigning king and his court. 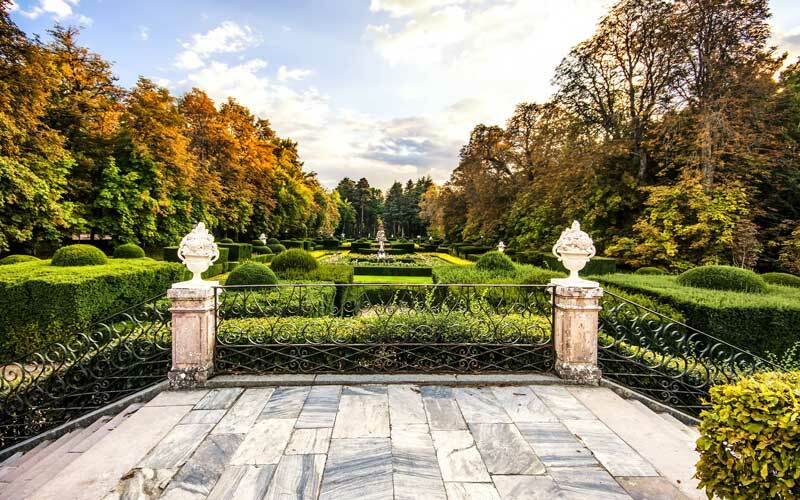 To this end, the gardens of the Palacio Real de La Granja that had been designed by René Carlier, inspired by the layout of those of Marly, the recreational palace of the French court (destroyed during the Revolution), were extended. After the death of Carlier, in 1722, the direction of the project was passed to Esteban Boutelou and Esteban Marchand. The design conception is obviously French-based, with its strict order and well–defined axis. However, the limitless dimensions of the designs were interrupted by the mountains. 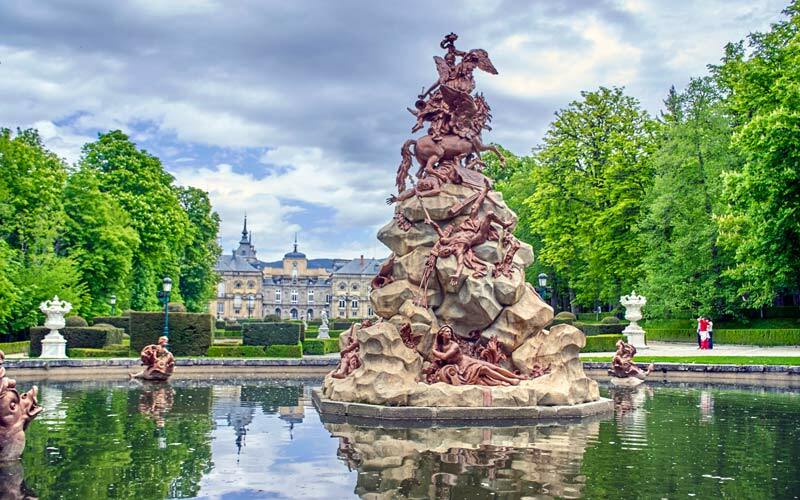 The Jardines del Palacio Real of La Granja can be defined as a succession of green decorations, designed to display a myriad of spectacular sculptural pieces made by French artists who had previously worked on the palace of Marly. For economic reasons and to save time, almost all of the pieces were melted in lead and then varnished to imitate bronze. The sculptures, illustrating mythological themes with undulating lines and asymmetry, are in the most popular style of the time: Rococo. But the real protagonists of the Jardines del Palacio Real of La Granja are its fountains, that still today dazzle visitors. To elevate the water to such heights only through pressure, they feed off of a large pond called El Mar, which is located in the upper part of the gardens. According to tradition, the source of the Fountain de la Fama is the highest in Europe; water spouts from the bugle of the goddess Fame, which proclaims the glory of the Spanish monarchy. Both the king and his second wife, Isabel de Farnesio, were great hunters, and the figure of Diana, goddess of the hunt, could be a homage to the queen, which can be seen in the spectacular Fuente de Baños de Diana, the last one that was made before the death of the king, who, upon seeing her cried, “It amuses me for three minutes but it cost me three million!” This work was inspired by another court gala. The series of fountains called Carrera de Caballos, which forms a splendid ascending image, is inspired by the Grand Canal of Versailles. Another footprint of the Jardinería Gala are the Hornbeam hedges (Carpinus Betulus) and the trimmed Yew trees (Taxus Baccata), two specied that were brought form France that were used in the palace from its beginning. Despite its unmistakable French air, the Jardines of La Granja employ several Spanish elements, reminiscent of Spanish–Islamic gardens. These include the lack of an overarching plan, a large deposit of water at the top of the garden (El Mar), and irrigation channels. Also worth mentioning are the Jardín de la Botica, an orchard that used to supply medicinal herbs to the Real Farmacia; and the Jardín de la Reina, where the Italian gardeners of Isabel de Farnesio planted fruit trees that adapted to the harsh climate of the enclave. The queen, when the was widowed, converted La Granja into a permanent residence. She said that in the winter, it turned into a “cake of snow.” Just because of its cool temperatures, the Palacio of La Granja became the summer residence of the Spanish court until the first decades in the 20th century. In the 19th century, new species were introduced, such as the immense sequoias and the cedars that have nothing to do with the original spirit of the gardens. Recently, the labyrinth made by hedges of hornbeam and beech trees was restored. 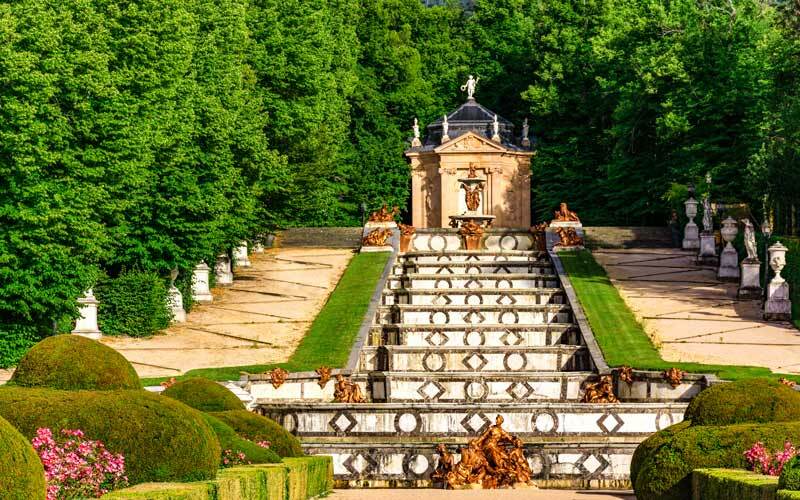 Originally built to be a game for the idle courtiers, it is now an inviting place to get lost.